Nokia has pushed out a significant map update to their HERE maps app for both Android and Windows Phone. The update does not effect the app already installed on your Windows Phone but instead is a map update which you do from within the app itself. According to the Nokia HERE maps blog, the update is a global update to new countries, water features and public transportation maps. Cyprus, Mayotte and Zimbabwe have had their entire maps updated to navigable status, meaning you can now get full turn-by-turn directions across those countries. Meanwhile, there have been significant improvements to the maps for Comoros, Djibouti, Eritrea, Fiji, Gambia, Liberia, Madagascar, Sierra Leone and Somalia. Water features are now also identified as well as more detailed maps of water features throughout various countries. Public transportation is also updated, reflecting the actual subway and over ground routes of trains in Singapore, Sao Paulo, Rio de Janeiro, Kaohsiung, Taipei, and Curitiba. This new improvement is actually an expansion to what Here maps had in the last update where they first showed this major update in public transportation in Chicago to better match the reality on the ground. 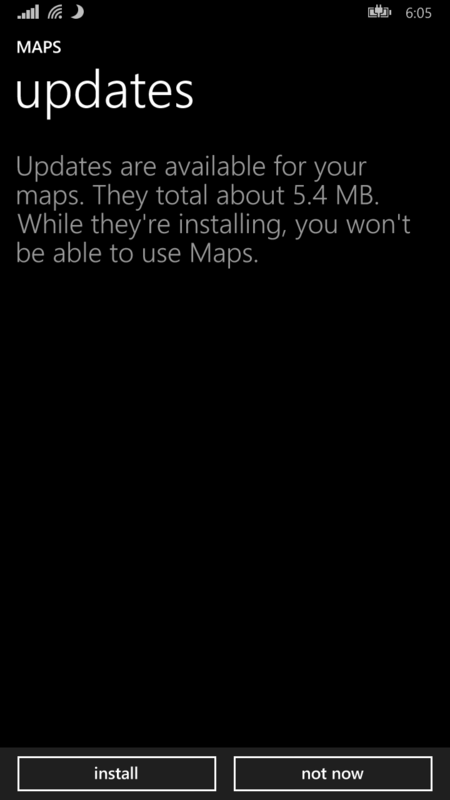 To get this update on your Windows Phone to got Settings>Applications>Maps and then tap the Check for Updates. You will be notified if the update is available for you and you can tap the Install update and you are good-to-go. The update takes just a few minutes. Here maps for Windows Phone is a free app and is available in the Windows Phone Store.